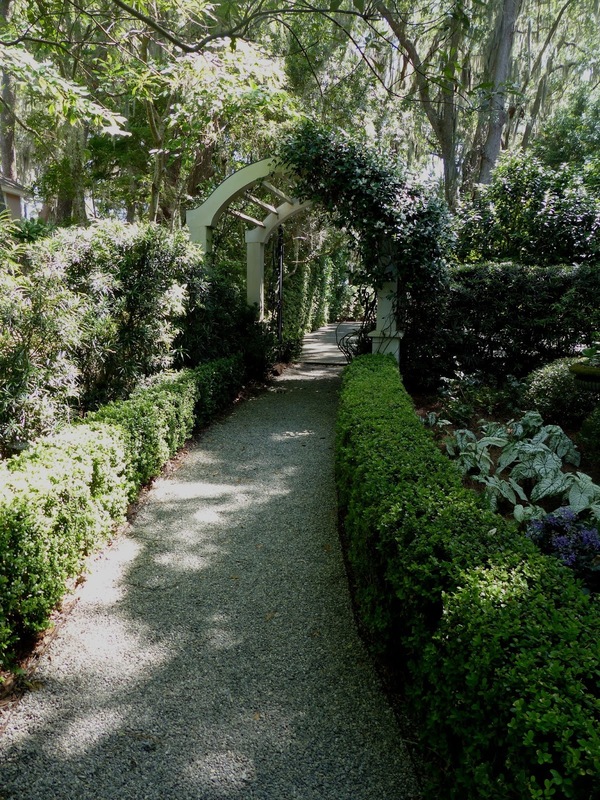 As I approached this garden's entrance in St. Simons, Georgia, a flood of memories came rushing back. First, I have to say that I was entranced by this entire garden, which was on a tour last weekend. 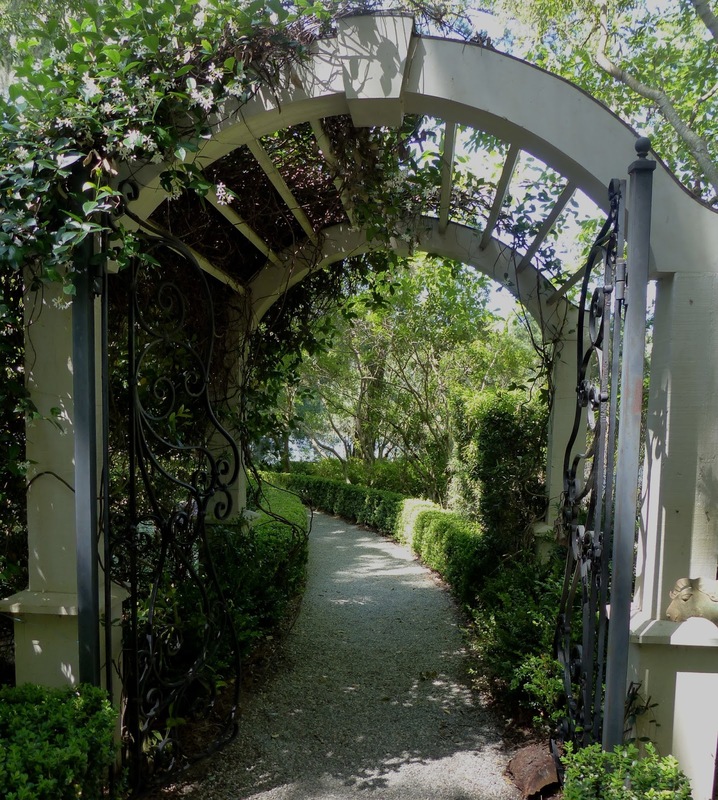 It had all the elements I love - arches, hedges, gravel paths, with exuberant vines everywhere (example: a dusky pink, wild-looking rose billowing from a live oak tree; fragrant Confederate jasmine outlining the back door). But the memories. I saw this arch and thought immediately of my late husband's folly. He was a part-time gardener, that is, he went mostly in spurts and frequently abandoned projects midstream. He had seen a similar entrance arbor like the one above in a Smith & Hawken catalog. So, in spite of dozens of other projects that needed attention around our house, he set out to re-create a rose-covered, white wooden garden entryway up at the little house. Only, the "entrance" he had two men build was not an entrance at all, but a free-standing arch that led to nowhere. Once you stepped through the impressive structure, crunching the pea gravel underneath, you were at a dead end. Well, not exactly, but you would have had to step down a slope covered in raucous Vinca major to get anywhere. This was especially dangerous, as you would have to have legs five feet in length to make the giant leap to the next level. Your best bet was to slide through the vinca and just hope. But, he was proud of the arch. There were six round columns, three on each side. The white wooden columns, discarded by a law partner who was renovating his house, were connected at the top by beams; perpendicular cross pieces formed the canopy. While the one above is fancier, with iron sides, a gate and an arched top, my husband's looked remarkably similar. That first year, he planted an old fashioned annual vine called Dutchman's pipe. It was much too rustic for his elegant white pergola, but the thing did have a lot of leaves and a few crazy-looking blooms. The next spring, I suggested digging a 'Dorothy Perkins' rose (the most popular rose from Jackson & Perkins in the early 20th Century) that was growing a few feet away. Instead, nothing was planted. The arch stood without adornment. Not too long after my husband died, the bottoms of the columns began to rot. Even though the wooden plinths at the base were up on bricks, they rotted, too. The guys who built it had long since moved away, and no one seemed to know how to fix it. Every workman who looked at it was a naysayer. When you lose a spouse suddenly like that, you have a million other things that take up your time and efforts. I just didn't have the gumption to tackle the project. At last, the whole thing collapsed. So, I felt a little glimmer of guilt and sadness at seeing this entryway. But, it also made me smile thinking of my husband and his arch to nowhere. This one was partly covered in Confederate jasmine. Below, you can see a view of the other side. I loved walking down that boxwood-lined path and coming out into the open garden overlooking a lake. The house was set among tall live oaks dripping with Spanish moss, and the narrow, winding road leading to it was like being in an enchanted forest. I'm sure their wooden arch in such a humid climate requires a lot of upkeep, but it adds to the magical setting and for me brought back some bittersweet memories. Love your posts...can almost smell the Jasmine! Gorgeous arch! Your beautiful photos and wonderful writing made me feel like I was there.